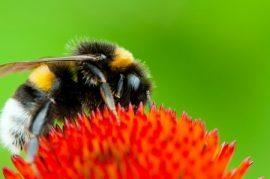 Recently, in the state of Minnesota, a great scientific discovery was made regarding a bumblebee that was not only just added to the federal endangered species list this past March but is also rarely seen in the state these days—and the discovery wasn’t made in some laboratory. It was made right in the field by volunteer Andrea Sampson Townsend in southeast Minnesota. As she described it, “I looked down and right on this little bee balm plant—right next to me—was this little bee.” That little bee was the rusty patched bumblebee, which, as stated previously, has been deemed endangered by the U.S. Fish and Wildlife Service. As a first-time volunteer for the Fish and Wildlife Service, Sampson Townsend wasn’t quick to believe her own eyes, saying, “My brain kept saying, ‘You’re only seeing this rusty patched because you want to see it. What are the chances?’” After sending several of the 200 pictures Sampson Townsend took with her phone, a bee expert with the University of Minnesota confirmed her find. “I think I put in the subject line in the email, ‘could it be’ and a question mark,” says Sampson Townsend. “And she put ‘yes, it is.’ Exclamation point.” Afterward, the rusty patched bee was released back to the wild. The Minnesota Bee Atlas, run by the university, uses volunteers for studying bumblebees’ ranges within the state and for gathering information on other species, such as honey bees. Sampson Townsend’s discovery is huge for the bee atlas, which hopes to build a better catalog for Minnesota’s 425 known bee species and thereby better understand and protect them. 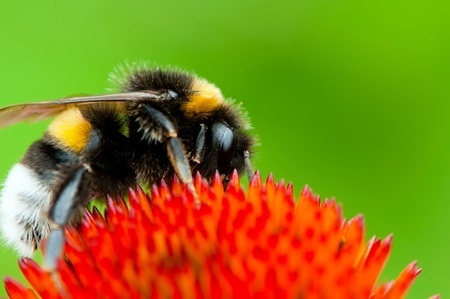 The role of citizen scientists, such as Sampson Townsend, in bee research cannot be understated, as they can reach further areas within a state than if it was just bee researchers on their own. As well, the volunteers often become advocates and educators in their own communities the more they learn about native bees, says Britt Forsberg, who coordinates surveys for the Minnesota Bee Atlas. As well, the information citizen scientists bring in can establish how factors like development, disease, and pesticides affect the bees.